Disclosure: My family and I received a complimentary stay at Summercamp Hotel; all opinions expressed are my own. 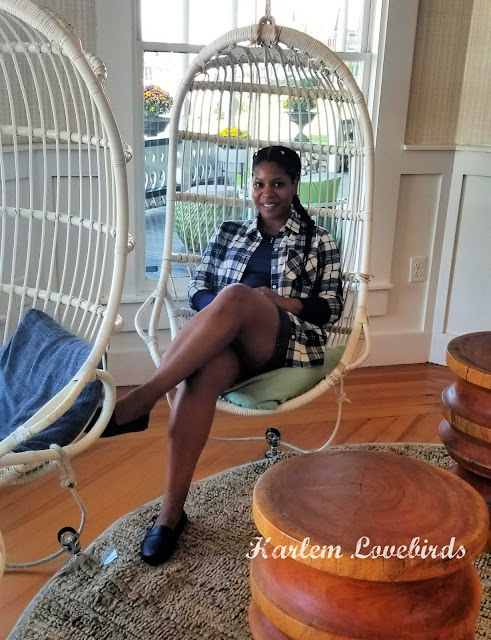 As much as I've shown Martha's Vineyard on my social media feeds I had never been there with Mr. Lovebird AND the kids up until this past weekend when we were guests of Summercamp, a delightful hotel in Oak Bluffs on Martha's Vineyard that's part of the Lark Hotels boutique collection. 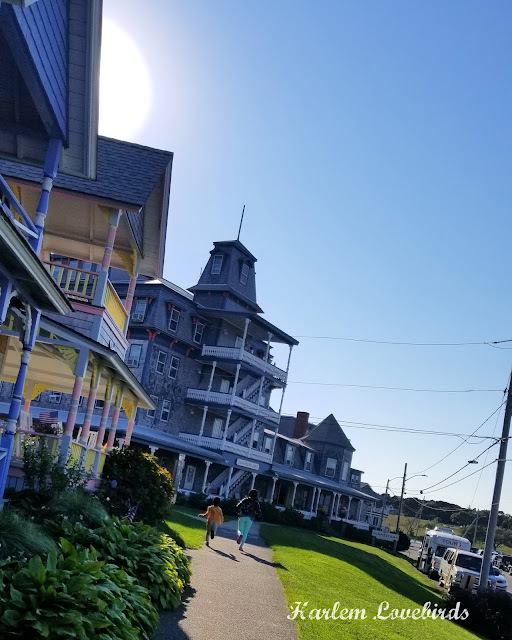 We've been covered in gray skies and rain lately in Massachusetts, but the bright blue skies and gorgeous sun broke through just in time for our first visit to Martha's Vineyard as a family. We were there for about 24 hours, and we definitely made the most of it. This is always the start of the Martha's Vineyard excitement for my kids! Martha's Vineyard is an island that most people take a ferry to get to (you can fly too! ); cars are allowed but have to be booked in advance. I'd recommend just parking at the ferry lot and enjoying a car-free experience. We drove just over an hour from our home in Boston to the Island Queen Ferry departing from Falmouth on Cape Cod. Because it's post-Labor Day weekend (aka off season), getting over the Bourne Bridge to Cape Cod was faster than usual, and we timed our departure to get to Summercamp soon after the 3p.m. check-in time. Nia's favorite is the pink one! Getting off the ferry is an easy walk to Summercamp but approaching the hotel you're going to want to stop when you're greeted by the most adorable Gingerbread Cottages. The whimsy can't be missed, and the kids and I stop each and every time we arrive so we can meander. Uka's wondered if it would be possible to fit inside one given his 6'8" frame, but we'll have to plan to answer that question on a future visit! The photogenic Cottages are a group of 318 Methodist camp meeting houses dating back to the 19th century (there used to be 500 and you can check out their history here). Finally we were on our way to Summercamp and once we entered the whimsical lobby the kids squealed remembering when we briefly went into the lobby last summer to check it out. Although the building dates back to 1879, Summercamp wasn't around when Mr. Lovebird and I first visited over 10 years ago when we were dating. Its current renovated state which includes 95 rooms was completed in 2016 and the entire property is truly delightful! It didn't take long for the kids to immediately jump right into play mode scrambling for the swinging chairs which became a must each and every time we went into the lobby. I mean, the lobby does have the command "Play" on the wall! After a quick check in we made our way into the adjoining building to our harbor view room on the first floor. 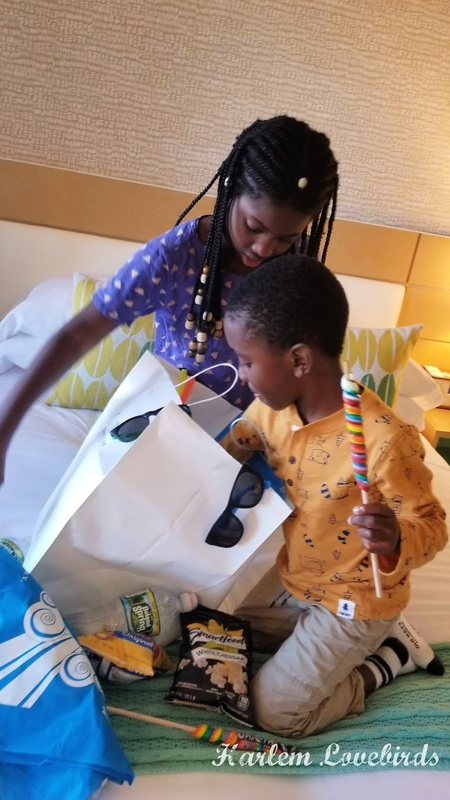 The kids were immediately smitten upon entering it when Nia spied the goodie bag filled with special treats for us to enjoy. They deemed it the "best day ever" and promptly hopped on their bed to go through allllll the goodies before I could snap my proper blogger photos hence the stock photo below provided by Summercamp! This room was similar to ours! The room was so cherry and the perfect space for us with windows overlooking a porch and right around the corner from the hospitality station where Uka and I grabbed coffee. We made our way back to the main lobby to check out the Rec Room, swing chairs and the Canteen aka "snack heaven" according to the kids! Throughout the weekend every time we returned to the lobby the kids had to have a swing and an impromptu ping pong match. I got to enjoy the swing too! I also loved how the little nooks and seating area on the porch and throughout the lobby inspired impromptu conversations like when we met a couple visiting from Philadelphia who gave us ice cream shop recommendations. Mr. Lovebird deemed it the best lobster roll of his life! For such a small island the food on Martha's Vineyard is outstanding, and we kept it simple by sticking with our favorites: seafood and ice cream. While Mr. Lovebird opted for a lobster roll for dinner at Lookout Tavern, I had lobster tacos. Nia enjoyed steak skewers and Grayson had his favorite staple: chicken fingers and fries. After dinner we changed to warmer clothes before heading to Ben & Bill's for ice cream. The kids and I opted for kiddie cups, but Mr. Lovebird just had to outdo us with 3 scoops! And yes, he did managed to finish it. While we saw a few people in the water during our stay, we opted for land-based activities and went stopped by Anderson's Bike Rentals to gear up for a family ride Sunday morning before check out. It was our first time riding together, and I was nervous about Grayson being able to make it for the full hour on a tandem bike with Uka. We explained to him that he didn't have to peddle, but he insisted! To my surprise his little legs were able to keep up. 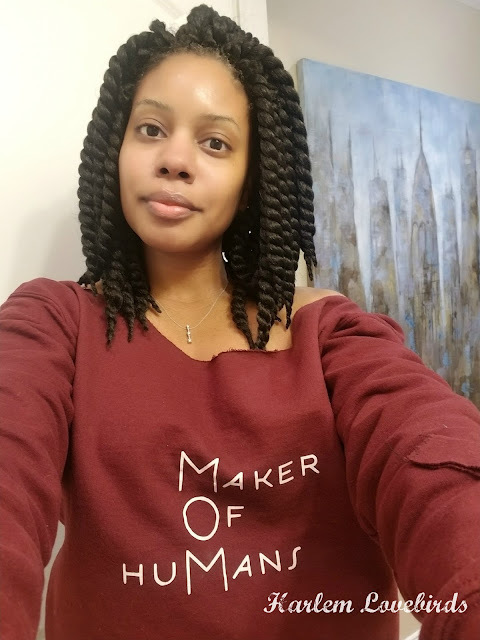 Nia did an amazing job on her adult bike! Her long legs made to the next town over, Edgartown, before we turned right back around and she maneuvered so well. By the end she was gushing over how much fun she had and insisted that Uka and I purchase bikes so we can go on more rides as a family. Duly noted! Besides biking we had a good old fashioned game of tag thanks to Grayson! As soon as he saw Ocean Park's wide expanse of green he took off running. That kid is F-A-S-T but his and Nia's little legs just couldn't keep up with Mr. Lovebird's giant stride. We made it back to Summercamp after brunch to shower and pack up, but we couldn't resist one last game of ping pong and some video game time. We're already looking forward to coming back next summer! 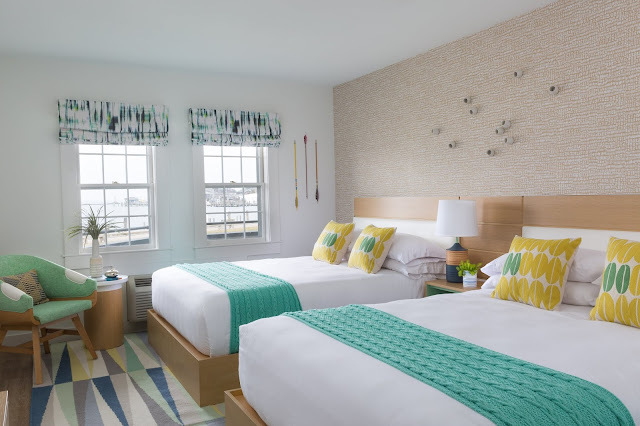 If you're interested in checking out Martha's Vineyard during the off-season Summercamp has 20% off weekday promotion running through the end of October here and consider other beautiful Lark Hotels as well! P.S. For more fun including a room tour and Nia's silly little dance I caught her doing in the middle of her ping pong game with her dad check out my "Vineyard" highlights on my Instagram Stories!